The Association of Railway Museums' (ARM) Spring Conference will be held on April 7 and 8, 2006 in the Twin Cities of Minneapolis and Saint Paul and is being hosted by The Minnesota Streetcar Museum. For complete information about the agenda and program, including a registration form, hotel information, and transportation information, please visit the MSM	website, or the ARM website. The registration fee is $50.00, the deadline for registration is February 28, 2006 (although you can register after that), but please note that the convention rate at the Holiday Inn Express at Bandana Square in Saint Paul is good only through March 7, 2006. The ARM Board will meet during the day on Friday, April 7 at the hotel. 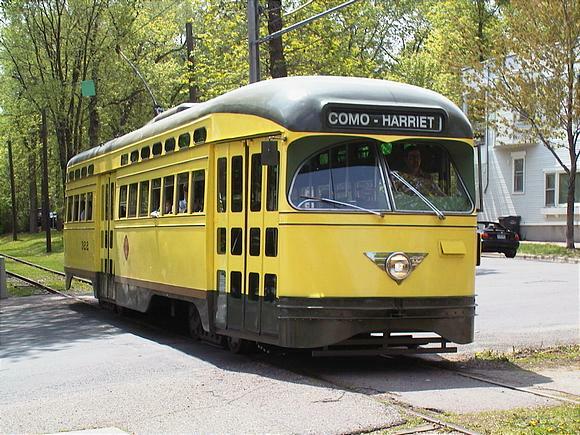 Guest operations at the Museum's Como-Harriet Streetcar Line will be offered from 12:30 to 4:30 p.m. that afternoon (no transportation arranged). That evening, after dinner on your own, the group will go to Como-Harriet, located in southwest Minneapolis, for an evening of dessert and nighttime streetcar operations along the Museum's historic "Glen Line" connecting Lake Harriet with Lake Calhoun, once a part of the historic Twin City Rapid Transit Company's Como-Harriet route. On Saturday, April 8 during the day, the conference will offer a variety of sessions on basic exhibit design, exhibit design on a budget, fundamentals of fundraising, insurance, museum communications and newsletters, and ARM's recommended practices for railway museums. In addition, ARM's Education and Interpretation and Parts and Consumables Committees will meet. During the extended lunch break, conventioneers may visit the Twin City Model Railroad Museum's fabulous O-gauge layout (admission not included in registration fee). 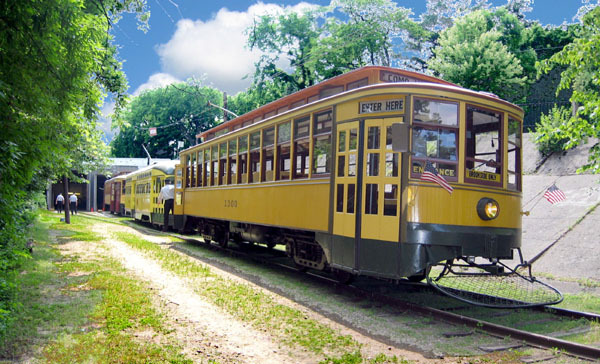 That evening, we'll head out to west-suburban Excelsior, on the shores of Lake Minnetonka, for dinner and a visit to the Museum's Excelsior Streetcar Line. TCRT No. 322, a 1946 Saint Louis-built PCC, may be in service at Como-Harriet during the conference. Photo by Bruce Adelsman. Because the Museum's streetcar lines are closed in the winter and the the bulk of heavy maintenance work on the fleet is done during the long Minnesota winter, not all of the Museum's operable streetcars will be in service. Expect to ride Duluth Street Railways No. 265, a double-truck wooden streetcar built in TCRT's Snelling Shops in Saint Paul in 1915, at Como-Harriet and DSR No. 78, a single-truck wooden streetcar built by the LaClede Car Company in Saint Louis, Missouri in 1893, at Excelsior. TCRT No. 1300, a double-truck wooden streetcar built at Snelling in 1908 and a Como-Harriet stalwart, will be out of service until late spring because of some work on the frame and extensive wood work. TCRT No. 322, a 1946 Saint Louis-built PCC, may be in service at Como-Harriet by then. Other MSM equipment such as TCRT No. 1300, a Como-Harriet stalwart, will be out of service until late spring because of major off season repairs. Photo by Jim Willmore. At Excelsior, conventioneers will be able to see TCRT No. 1239, a 1907 double-truck wooden streetcar built at TCRT's 31st Street Shops in Minneapolis in 1907 and undergoing truck and wheel work, Mississippi Valley Public Service Company (Winona, Minnesota) No. 10, built by Saint Louis Car Company in 1913 and undergoing restoration, and Mesaba Railway No. 10, a 1912 Niles-built interurban, which is not restored. The Museum's other streetcar, Fargo and Moorhead Street Railway No. 28, a 1913 American-built single-truck Birney, is stored off-site.